Uncial, the beautiful, open and round, historical alphabet as seen in the Book of Kells, is sometimes called the early Christian alphabet as it was used in much of the early Holy writings. It is an all majuscule alphabet, so is quickly learned and is a good beginning for those new to calligraphy. 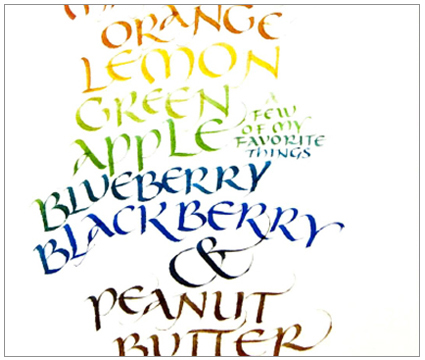 The more seasoned calligraphers will refine and develop their Uncial and will create new looks with the myriad variations. All will love its smooth flow and beautiful open quality. We will begin the course with an in-depth study of the classic Uncial form and graduate to a more modern style by exploring the many Uncial variations to create a more expressive, personal Uncial. There will be a take-home class project to commemorate some of our new-found letterforms. Please email Ann Cobb if you wish to be placed on the waiting list.